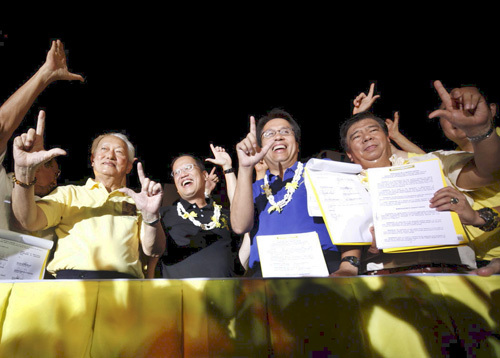 "LABAN" SIGN: Manila Mayor Alfredo Lim and Senators Noynoy Aquino and Mar Roxas flash the "Laban" sign as former Senate President Franklin Drilon brandishes the coalition agreement signed by Lim's local party Laban para sa Katarungan, Kapayapaan at Kaunalaran (KKK) with the Liberal Party in a rally attended by thousands of Manilenos at the Bonifacio Shrine near the Manila city hall Monday afternoon that lasted up to 8 p.m. Lim formally endorsed the candidacy for President and Vice-President, respectively, of Aquino and Roxas and their entire senatorial slate headed by Drilon. Bukidnon Rep. Teofisto Guingona Jr. and former Bukidnon Rep. Nereus Acosta (not in photo) also attended the Manila rally. Aquino and Roxas also formally endorsed the re-election bids of Lim and his Vice-Mayor, Iskho Moreno, and Lim's local ticket for the 2010 elections.